News Corp Australia chief information officer, Tom Quinn. 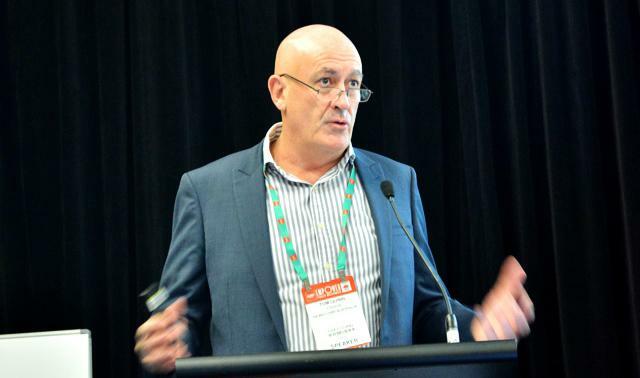 News Corp Australia chief information officer, Tom Quinn, has outlined the company's technological strategy as it shifts gears in the face of major disruption. Quinn said "news" had gone from being a manufacturer to a retailer as a result of online disruption and that speed was now the most critical factor in the rapidly changing media landscape. "The media game being absolutely affected by this disruption, which is still continuing to cause us to be slow and fat, and not being reactive to your audience is death," he said. "No longer do we just produce newspapers and stick them on a truck and dump them at the newsagent. "We now have to act like a retailer and market different sorts of products and bundles to everybody we can connect with, and being a quick retailer with good product generally gets more of the pie. So the KPI (key performance indicator) for us is now speed. Getting to market quickly." Quinn said the company had defined a Cloud first strategy 12 months ago and planned to have 75 per cent of enterprise applications in the Cloud by 2015. "In 99 cases out of 100 we are picking Infrastructure-as-a-Service, Platform-as-a-Service or Software-as-a-Service," he said. "In our digital business, just about everything we operate is a Cloud product, we have taken a very aggressive line to get to the Cloud." "By the end of 2015 I want to have 75 per cent of our compute in the Cloud and I would dearly like to be 100 per cent, but I do have some legacy apps that aren't there yet." The company now uses Amazon Web Services for most of it Cloud, while Microsoft Azure and Google Enterprise makes up the remainder. News has recently enlisted Mulesoft to provide connectivity between the evergrowing list of enterprise applications needed in the business. The enterprise integration platform was used to connect News's content management system with tablet apps for its major mastheads. "We have just released a new range of tablet apps on our metropolitan mastheads in the last couple of days," he said. "We used Mulesoft to put together a new suite of APIs which takes content from our content engine and allows us to automatically populate the tablet app in an order similar to the newspaper with minimal touch." Quinn said coders in the business did not like the new technology because it was drag and drop. "You're not holding the business to ransom to detailed, intricate, costly in house development to get things hooked together," he said. "Ninety-nine per cent of effort should be in the business problem not in complicated technology." Companies spend $527 billion a year connecting their systems together, while News spends 30 per cent of its IT budget on integration. Quinn said he expected Mulesoft to halve integration time, which in the past had been about 18 months. He said time and cost savings would improve over time as processes were refined. "It enables warp speed because it's simple and it institutionalises re-use, which I think it one of the holy grails of IT," he said. "For us Mulesoft is not about rewriting the past, it's about creating a new future that is faster, cheaper and that suits our business a whole lot more. "In this game we need to be faster and cheaper, and we need to get the product to the market as quickly as we can."